Lewis Hamilton has won his second consecutive grand prix after his chief rival made a critical tactical error. After besting Daniel Ricciardo in Monaco by virtue of a Red Bull Racing pit stop howler, the reigning world champion was handed the race lead by a Ferrari gambling on an unlikely two-stop strategy. Vettel mugged both Mercedes cars off the line, leading easily into the first turn and leaving the slow-starting Hamilton and his teammate Nico Rosberg to battle for second place. However, an aggressive move on Hamilton’s part to push Rosberg off the track won him the runner-up position and put him into a straight fight with the four-time world champion. Though the paddock was licking its lips over the long-awaited Vettel–Hamilton battle that seemed finally to be taking shape, Ferrari had other ideas, and on lap 11 it stopped both its drivers for supersoft tyres, committing them to two-stop races. 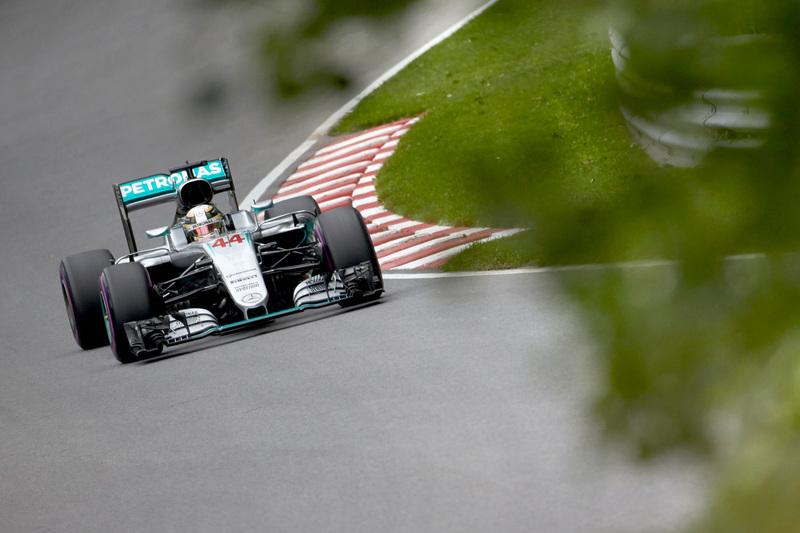 The result was to gift Hamilton track position, which the Briton ultimately converted to victory. As had been the case in Monaco, the ultrasoft tyre — even the used set on Hamilton’s Mercedes — demonstrated similar performance to the supseroft, meaning Vettel’s first stop gained him little in exchange for the lost time. The only moment of worry for Hamilton came in the closing 20 laps of the grand prix, when a swag of cars behind the leading duo nervously switched from the one-stop to two-stop strategies in anticipation of chronic tyre wear, but the Mercedes car showed no such drop in pace through to the end of the race. Vettel inched the gap closed, but struggled to hold it at less than five seconds — and critical lock-ups at the last turn and hairpin sealed his fate. “Lewis was a bit too quick, that was the issue,” said Vettel on the podium. “I was pushing all race. But the German was relieved to put Ferrari back on the podium after a string of difficult races in which the team was unable to exploit the car’s potential. Hamilton was doubly rewarded for his faultless driving, both by taking home the win and by, after nudging his teammate off the circuit at the first turn, slashing his championship deficit to just nine points. Championship leader Rosberg, on the other hand, suffered a torrid afternoon largely not of his own making. After dropping to ninth on the first lap and being pushed down to P10 by an aggressive Nico Hülkenberg, Rosberg battled his way up to fourth before a slow puncture forced him into an unscheduled pit stop with 20 laps to go. An aggressive drive from seventh put him into contention for fourth, which was held by a flawlessly defensive Max Verstappen, but there was no way past the Dutchman, and a last-gasp attempt put Rosberg onto marbles and into a spin a the last turn, ending his challenge and leaving him fifth. But while Rosberg was unable to play a part in the podium permutations, Williams and Valtteri Bottas quietly chipped away to bring home an unlikely third place. The Finn started seventh and made up four places before making his sole pit stop on lap 22. He earnt two places on the back of both Kimi Räikkönen and Max Verstappen’s second stops, and the Williams car was able to make short work of Daniel Ricciardo’s Red Bull RB12 on worn tyres, winning Bottas his second consecutive Canadian podium. “I’m really pleased with today,” said Bottas. “As a team it was a really strong one for us. “Really good strategy, really good pit stop. The timing was perfect, the car felt perfect.